The Domain Castelas’ story began in 1997, when they fell in love with some old olive trees, planted in south-facing land in the rocky range of Les Alpilles, in the locality of Castelas. Today, Domaine Castelas produces olives on 110 acres of Appellation d’Origine Protégée groves in the Vallée des Baux de Provence, and in 160 acres on the Plaine de Crau. 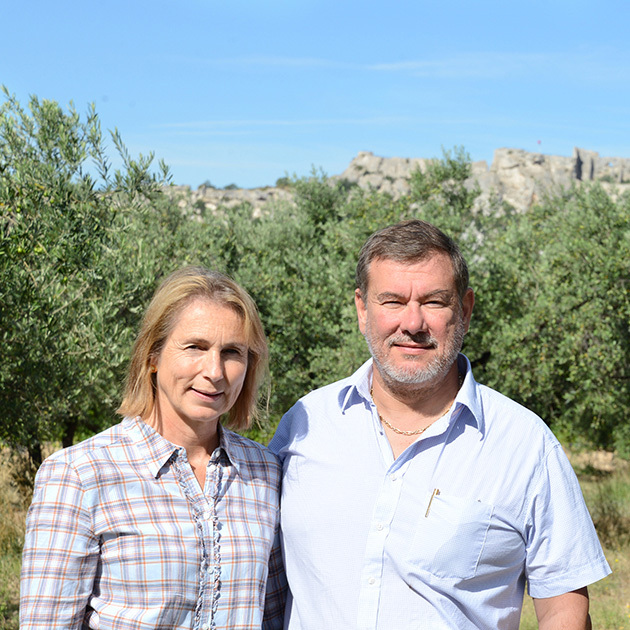 In this mill, at the foot of the Château des Baux, Catherine and Jean-Benoît combine know-how, passion, exacting standards, technique and all of their olive farmers’ sensibility to create intensely powerful olive oils year after year, for pleasure constantly renewed. In their characterful oils you will find the terroir of Les Alpilles, the varieties typical of the appellation (Salonenque, Aglandau, Grossane and Verdale) and the miller’s manual craft. The CastelineS Collection unveils their oils’ treasures of flavour and complexity, distinguished regularly by prizes at the Concours Général Agricole in Paris.